230 Oak St #14 South Haven. Slightly off the beaten path but still close to everything fun... like shopping, restaurants, and the beaches. 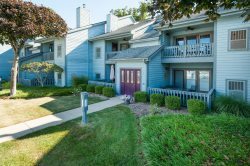 This condo will offer a beautiful, remodeled interior and a very peaceful setting. A great place to slow down! This property was clean & had everything we needed. We enjoyed watching all the boat activity on the river from the large balcony. Wish this property allowed weekend rental...we would be back in Oct. When we needed a couple of household items our vacation condo was missing, the office staff were friendly and quick with their response. Landings is well-maintained and our condo, Landings #14 was very clean, neatly maintained, nicely decorated and comfortable.